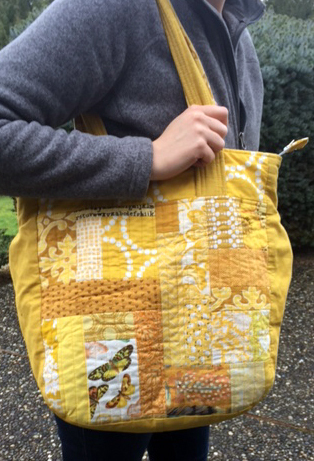 It seemed fitting for today to share my Super Tote from Noodlehead that I recently finished. While yesterday’s Big Game didn’t turn out how we had hoped, it was a very exciting game and we are already looking forward to next season. We still love our Seahawks! 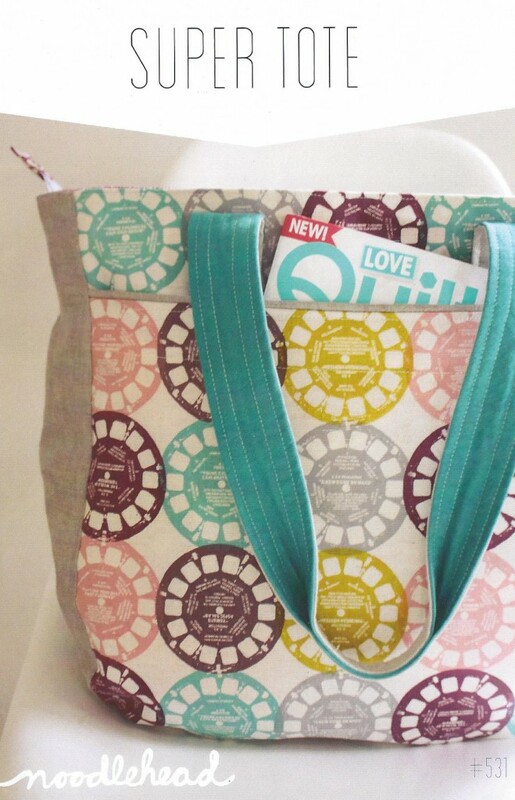 This is my fifth Super Tote and I am in love with this pattern and this bag! 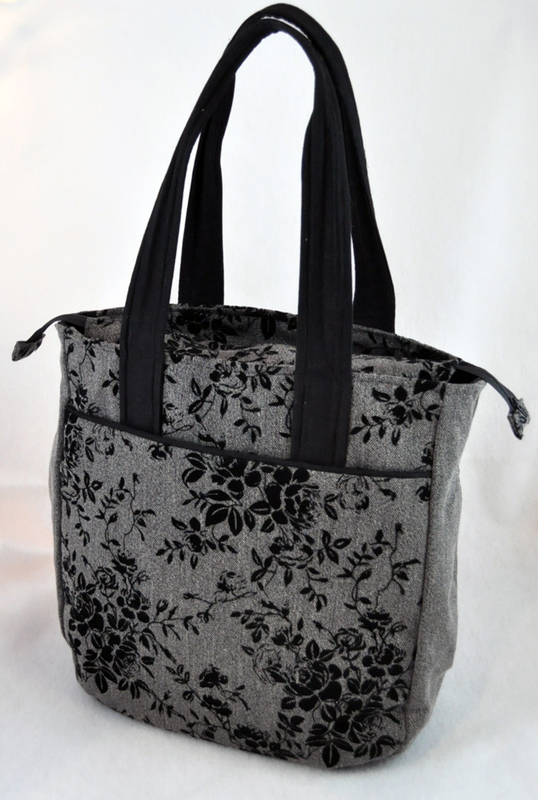 It is the perfect tote for on the go, whether it is running errands or a longer trip. Last year I made matching Super Totes for a group of us that went on a sewing retreat together- each person got a custom bag in their favorite color. While I loved making the scrappy, quilted tote bags I couldn’t wait to make my next one in a more sophisticated, fashionable fabric. My First Super Tote- Scrappy! When we first found this Flocked Herringbone Suiting, I knew this would be the perfect fabric for my next Super Tote. The blacked flocked rose vines give it an amazing texture and it feels amazing. The big question then became, What fabric to pair with it for the gusset (sides) and handles? I auditioned all different fabrics but none were quite right. I kept thinking- I just need a fabric similar to the background of the flocked suiting. Duh- Why don’t you just use the wrong side, Michelle! Sometimes the obvious option is just too obvious. I completed the look with classic solid black handles and accents. 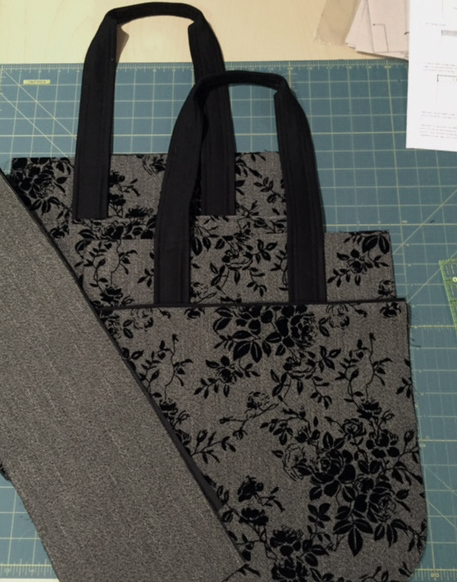 Anyway- once I got everything cut out, the Super Tote was a breeze to put together. I finished it over a long weekend, working on it off and on as I had time. To give it a little extra stability I paired the Pellon Shape-Flex (as called for in the pattern) with Pellon Extra Firm interfacing. While the Herringbone Suiting is a heavier weight fabric, the added layer of Extra Firm gave the whole purse a really nice stability without being too thick or stiff. I also wanted to share a couple pictures from our Football Gathering yesterday as well. Just a small group of family and friends, but I love any excuse to surf Pinterest and try out some new recipes. The chop salad stuffed pasta shells were a huge hit. And I loved the idea of serving “Turnovers” for the game. I used store bought puff pastry- filled them with whatever berries I had in the freezer and cut them out using the Jersey cookie cutter I had from last year’s sugar cookies. Too cute and so delicious! I hope you had great day yesterday, whether your team won or lost!